SAHM's, I'm going to get real here for a minute if you don't mind. As of late, I have heard quite a few SAHM's saying when someone asks them what they do for a living, "Oh, I'm just a SAHM!" Now, I've been on both sides of the fence. I was a working mom for 2 years and have been a SAHM for a little over 2 years. While both are very difficult, by no circumstance would you have ever heard me when I was a working mom say to someone "Oh, I'm just a nurse!" Why do you ask? Because I worked hard. All. Day. Long. While at the time I didn't totally get what SAHM's really did because I hadn't been one yet, I knew they worked hard. It bothered me as a working mom and still bothers me as a SAHM to hear women demean their position in life. Being a stay at home parent isn't easy. There are some days where I have thought to myself I had easier days sometimes working outside of the home. There were also days when I worked outside of the home that I thought to myself it would be so much easier to stay home with the kids. Neither is easy. Being mom, whether you work outside the home or stay home or work from home, is hard work. Something always needs your attention. There is always something on your plate. So when a mom tries to brush off saying that they're "just" a stay at home mom, it really upsets me because you are worth so much more than that. Yes, our society has shifted and many more women work outside of the home then when our grandparents were parents. But we are, regardless, all mothers and all have an incredible amount of responsibilities on us. 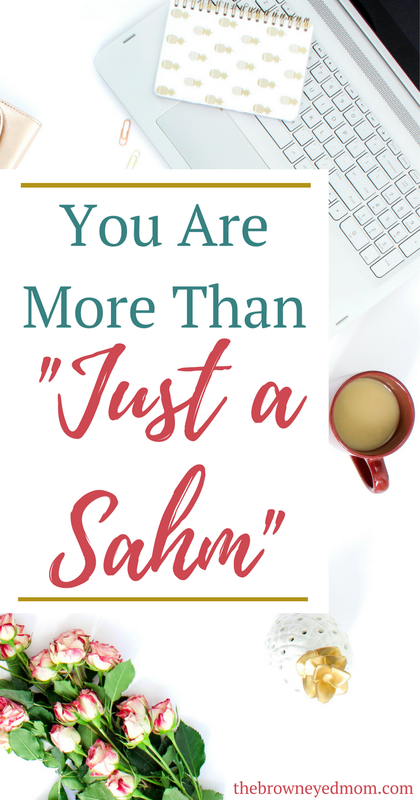 While some people do still see SAHM's as "having it easy" with their feet up on the coffee table (ironically, I am doing that right now with my laptop in my lap as I write this during naptime on a weekend! ), it's really not the case. I am just as exhausted at the end of the day as a SAHM as I was when I was a working outside of the home mom. And that's because I still have a ton of things on my plate. They may look a little different from when I worked outside of the home, but they are my responsibilities nonetheless. So, SAHM's... The next time someone asks you what you do for a living and you have that little hesitation to say you are a stay at home mom, don't hesitate. Say "I'm a SAHM!" or "I stay home with the kids and run a business from home." or "I work from home and stay home with the kids!" Be proud of what you do, whatever kind of mom you are. Working outside the home mom. Stay at home mom. Work from home mom. We are all moms and we all do some kind of work. They all look a little different from each other, but we all have something in common. We love our families and kiddos and are doing what we think is best for them.